ave spring fever, but desire great entertainment close to home? Look no further — because once again, Arts and Drafts at The Brewerie has you covered. With three days of local art and music, not to mention local brews, it's an event that brings everyone together. 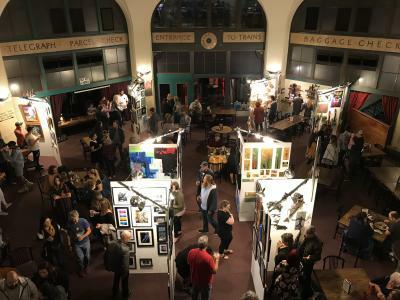 "Arts & Drafts has become a hugely successful and iconic flagship event in the Erie area, featuring the work of over 70 local artists and 14 local bands. The community support we've received has been outstanding," says a grateful Amanda Ferguson, coordinator of the event. In showcasing so many talented artists, it's a wonder where they're found. When asked about how artists come to interact and share their work, Ferguson explains: "I have been the event coordinator for the last six years for the Arts and Drafts Festival. When the festival was handed down to me, there were only 30 artists showcasing their work. From there I built the list up to 80 artists — close to 90 — with some people on the waiting list. I've been involved in our community for so long before taking over the festival I knew a lot of the artists already. I approached them and they were all game." Each Arts and Drafts hosts a featured artist, and this year that is Jason Amatangelo. If you're looking for some incredible 3-D work, then be prepared to be blown away by the stunning visual effects (and many, many layers) that evolve to create his works. Amatangelo enlightens: "I build my own shadowbox frames, then I can see what [the work] all looks like together. The multiple layers give it shadows, both physically versus placed, and I have to be careful because it can often look like an optical illusion." He explains that there's "a fine line you have to watch out for." When asked how long it takes to make such amazing, complex art, Amatangelo reveals "on average, 80 to a couple hundred hours" on a single piece. With so much time invested, what is unique about Arts and Drafts is that you have the rare opportunity to talk to artists like Jason Amatangelo about their work in person, and perhaps even purchase an original piece for your own collection. "The big draw for me with Arts and Drafts is that it's kind of a party atmosphere. You have artists that come in that are showing sculptures, tattoos, and what's cool is that you get to talk right with the artist. You can buy something that's original from the artist and talk to them, hear the story behind it," Amatangelo informs. Besides an exceptionally large pool of artists to check out, there's also a variety of local musicians and bands that make this event all the more engaging. Justin Moyar, one of the musicians on this year's lineup, explains that he sees Arts and Drafts as "the greatest crossover of art and music that occurs in Erie throughout the year. It showcases a plethora of local talent in a very unique environment that's historic in its own right. A person that feels disconnected with the art scene in Erie can attend this event and really understand some of the things that are going on." You can look forward to seeing Moyar's performance, which will leave you wanting more. "I've been dabbling with a lot of jazzier compositions for my next album. Even though it says just me on the bill, I'm definitely going to have some surprises that will help us get to where we want to be musically during the show," Moyar explains. Whether you are familiar or not with the local art scene, Arts and Drafts provides you with a chance to see what you're missing. Many underground artists and musicians will showcase their work, making this a unique experience — all while being able to enjoy local beer. "Back when the initial vision for Arts & Drafts was developed, the intention was to create an incubator for local artists, providing them with a platform to display their work and become recognized within the community for their individual talents. This initiative is one we've upheld for 11 consecutive years, and witnessing the success of the artists we've seen flourish and grow as a result of their involvement, well that's been extremely rewarding," states Ferguson.